The Center for Forced Migration Studies at Northwestern University is mapping polling irregularities on a Ushahidi-based open source platform here. At the site, you can zoom in on an area and read the individual reports as they appear. 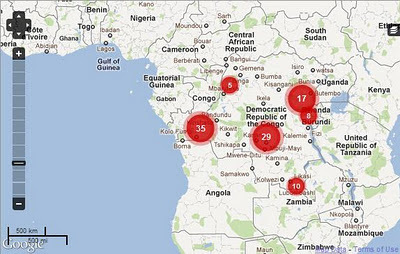 The Center for Forced Migration Studies at Northwestern University (CFMS) has coordinated a team of voluntary international and local partners to deploy Ushahidi open crowd-sourced mapping for the November 28th elections in the DR Congo to assist in election monitoring efforts and provide timely information for crisis response. This will be a short-term deployment (approximately November 14-December 31) focusing mainly four main sites: Kinshasa, Equateur province, North and South Kivu. The Ushahidi deployment is independent of the already existing monitoring efforts coordinated through the National Independent Electoral Commission (CENI) but seeks to strengthen and supplement these efforts.